In fifth pAsuram, AzhwAr says “All of you who are faithful to linga purANam, and your dhEvathAs are pervaded by nArAyaNa; this being the case, all of you surrender unto him”. Subsequently, rejecting bAhya (those who reject vEdham) and kudhrushtis (those who misinterpret vEdham0, AzhwAr says “emperumAn who resides in thirunagari is superior to all”. Fifth pAsuram. AzhwAr rejects those who bring kudhrushti smruthis (the texts which misinterpret vEdham) such as linga purANam and bAhya smruthis (the texts which reject vEdham) as authentic texts. Oh you who are kudhrushtis due to being faithful to thAmasa (mode of ignorance) purANams! Oh jainas! Oh baudhdhas! Oh you vaiSEshikas, who are debating through dry arguments! emperumAn is promoting those different dhEvathAs, you have considered as goal, to be at his (emperumAn‘s) disposal and standing in thirunagari where fresh paddy is available abundantly and the crops are appearing to be swaying like a chAmara (a fan made with fur) with completeness, is sarvESvaran himself; there is no falsity in this principle and thus you all praise him. 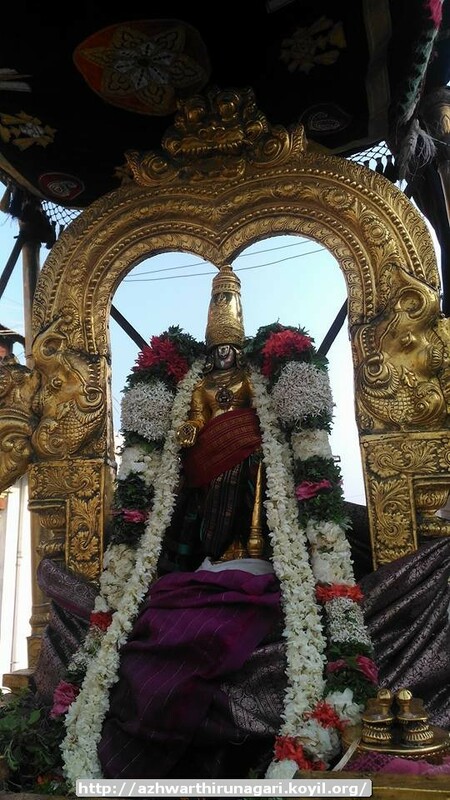 ilingaththitta purANaththIrum – This is the difference between sAthvika purANam and rAjasa/thAmasa purANam [that is, sAthvika purANams speaks the truth of vishNu’s supremacy as it is; other purANams exaggerate the greatness of a particular dhEvathA]. The crux of the purANam can be observed right at the beginning of the purANam; [in SrIvishNu purANam] as a general question is posed as in “yanmayam jagath brahman” (Oh best among brAhmaNas! who is pervading this universe as antharAthmA? From where did these universe appear? In where did they become subdued during deluge? and so on) and the answer is given specifically and naturally as in “vishNOs sakASAth udhbhUtham” (Everything appeared from vishNu, everything goes back to vishNu, that vishNu is the one who bestows birth and death; and he is the antharyAmi of everything); unlike this, in the rAjasa/thAmasa purANams, both the speaker and the listener being filled with thamO guNam, this purANam was written specifically to glorify lingam. This purANam is like the praising of a poet who obliges when requested to praise “a dirty eyed person to be a lotus eyed person” and when requested to sing “an buffalo as an elephant”; they are praised falsely just for the sake of praising without them having any such greatness; these praise would neither bring glory to the entity which lacks glorification nor will it reduce the glory of the truly glorious entity. maRRum valindhu vAdhu seyvIrgaLum – Those remaining bAhyas (those who reject vEdham), who try to establish their principles using dry/vague arguments instead of arguments based on the top most pramANams (authentic texts). As said in manu dharma SAsthram “yA vEdha bAhyAs smruthaya:” (Those texts which are outside vEdham and those texts which misinterpret vEdham – they are useless for this life and the after life; they are filled with ignorance); ignorance is part of everything [outside vEdha SAsthram]; that is why bAhyas and kudhrushtis are treated at par. num dheyvamum Agi ninRAn – He is the AthmA of both you all and the dhEvathAs you worship. When you glorify them, you should do that recognizing bhagavAn’s supremacy. This is because, their nature, existence etc are at his full disposal. Now, in every sect, they will glorify their own leader/prime as “sarvagya” (omniscient), “Isvara” (lord) etc. . When it is said “their nature, existence etc are at his full disposal”, is this based on our own philosophy or their philosophy? it is neither one’s philosophy – but it is said based on pramANam (authentic sacred texts). When some one observed superhuman attributes in a dhEvathA (rudhra destroying the three towns) and was asked “what is the reason for his super human abilities?”, it was said in mahAbhAratham karNa parvam “vishNurAthmA bhagavathO bhavasya” (vishNu is the antharyAmi of rudhra who is very radiant and worshippable); In atharva Siras, as rudhra started explaining his own supremacy like sarvESvaran would do, he was asked “how are you saying this?” and he said in atharva SikhA “sa: antharAthantharamprAviSath” (I am speaking like this because paramAthmA is inside me); prahlAdhAzhwAn said “maththassarvam aham sarvam” (Everything comes from me; everything rests back in me; I am everything); only when prahlAdha has supremacy, these dhEvathAs would also have that [obviously, prahlAdhAzhwAn is a devoted servitor of SrIman nArAyaNa]. malindhu … – Such sarvESvaran who is the antharAthmA of all, arrived and presented himself in AzhwArthirunagari to eliminate the question of “he is not present here”. Only due to his arrival here, without any differentiation between chEthana (sentient) and achEthana (insentient), everyone/everything could serve him as performed by iLaiyaperumAL (lakshmaNa) as sumithra said in SrI rAmAyaNam 40.5 “you were given birth to serve SrI rAma in the forest” [here both humans as well as the crops are said to be serving emperumAn – that is what is said by chEthana and achEthana]. When the fresh paddy crops sway, it appears as if they are performing the fanning kainkaryam to emperumAn. polindhu ninRa pirAn kaNdIr – When he descends in to samsAram giving up paramapadham, instead of suffering like them, his glories based on his svarUpam (true nature), rUpam (form), guNam (qualities) and vibhavam (activities) shine greatly. Whatever praises done by anyone, his glories are beyond those praises. onRum poy illai – As all the praises done for other dhEvathAs will remain false, there is no falsity in the praises done for emperumAn. As the other dhEvathAs don’t have any natural greatness, there is no truth in the praises done towards them; and as there is no limit to the greatness of emperumAn, there is no room for falsity in his case. pORRuminE – It is my great mercy towards you which makes me request you to praise him while you don’t desire for this; such mercy should fructify; instead of saying “it will happen over time” just try to surrender unto him immediately. This entry was posted in thiruvAimozhi, thiruvAimozhi 4th centum on May 2, 2017 by Sarathy Thothathri.